Podgorica is the capital and largest city of Montenegro. 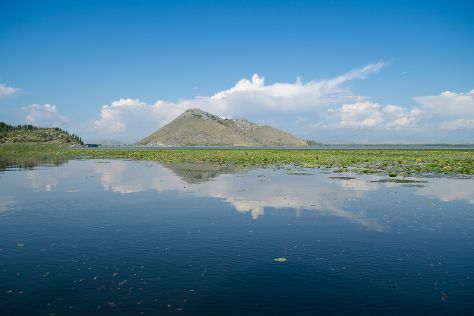 Start off your visit on the 22nd (Fri): explore the activities along River Tsrnoyevicha, then contemplate the waterfront views at Bukumirsko Lake, and then contemplate the waterfront views at Skadar Lake National Park. To see photos, reviews, maps, and other tourist information, refer to the Podgorica travel guide. If you are flying in from Australia, the closest major airport is Podgorica Airport. July in Podgorica sees daily highs of 39°C and lows of 25°C at night. Finish your sightseeing early on the 22nd (Fri) so you can drive to Budva. Montenegro's top tourist destination, Budva draws big crowds with its pulsating nightlife and sun-kissed beaches. On the 23rd (Sat), kick back and relax at Milocher Park, then kick back and relax at Red Beach, and then pause for some serene contemplation at Santa Maria in Punta Church. Here are some ideas for day two: kick back and relax at Jaz Beach, contemplate the long history of Altstadt (Old Town) Budva, take in the architecture and atmosphere at Church of the Holy Trinity, then make a trip to Budva City Walls, and finally contemplate the long history of Citadel. For reviews, ratings, maps, and tourist information, you can read our Budva travel guide. Traveling by car from Podgorica to Budva takes an hour. Alternatively, you can take a bus. Traveling from Podgorica in July, Budva is a bit cooler at night with lows of 20°C. Cap off your sightseeing on the 24th (Sun) early enough to go by car to Kotor. Start off your visit on the 25th (Mon): make a trip to Stari Grad Kotor, explore the activities along Bay of Kotor, and then take in the architecture and atmosphere at R.K.C. Gospa od Škrpjela. Keep things going the next day: step into the grandiose world of Kotor’s Castle Of San Giovanni, then stroll through Plavi Horizonti Beach, and then get to know the fascinating history of City Walls. For other places to visit, more things to do, maps, and more tourist information, go to the Kotor travel guide. Kotor is just a short distance from Budva. Expect a daytime high around 36°C in July, and nighttime lows around 20°C. Finish up your sightseeing early on the 26th (Tue) so you can go by car to Dubrovnik. Do some cultural sightseeing at Old Town and Stradun. Relax by the water at Beach Kupari and Sveti Jakov Beach. There's still lots to do: delve into the distant past at Gradske Zidine, examine the collection at War Photo Limited, don't miss a visit to Dubrovnik Cable Car, and head off the coast to Mljet. To see photos, reviews, ratings, and tourist information, you can read our Dubrovnik travel guide. You can drive from Kotor to Dubrovnik in 1.5 hours. Alternatively, you can take a bus. Traveling from Kotor in July, plan for a bit warmer nights in Dubrovnik, with lows around 24°C.